Repro-light is a European research project that aims to support the European lighting industry in moving towards a more sustainable and competitive future. 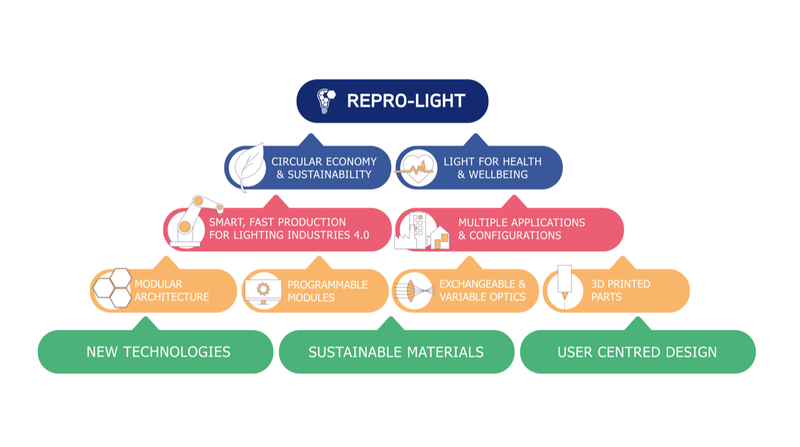 The Repro-light project will harness innovative technologies and materials to design a modular luminaire architecture with a smart production scheme as part of the circular economy, a reconfigurable customised LED luminaire, the ‘Luminaire of the Future’. Transformation of existing luminaire production approaches into next generation, smart production solutions based on modularity. Development of intelligent LED luminaires that are based on modularity and the ability to adjust to changes in the environment and/or to maintenance issues. The overall life cycle of a lighting system will be optimised starting with production and continuing with the luminaire material selection and ending with the usage of the devices. The quality of the light will be optimised to the requirements of human beings and then adapted perfectly to the application needs.